These days, it makes sense to look for a website builder better than Wix. And here is the answer why. Wix is getting older and – let’s put it this way – not flexible enough. This answer is obvious for professional web designers. But it may come as a surprise for a novice, right? So, in this post, we will look into the reasons for choosing Wix alternatives. Having done that, we will try to compare these alternatives so that you know which website builder better than Wix caters to your specific needs to the fullest. [Spoiler] At the very end of this post, you will find the table that covers the most important differentiating criteria of every website builder better than Wix. If you are running short of time, feel free to go directly to the table for better insights into Wix alternatives. Why Look for a Website Builder Better than Wix? If so many people want to find Wix alternatives, then one might think that there has to be something seriously wrong with Wix itself. The truth is, however, Wix is doing perfectly fine and remains one of the most popular website builders on the web. So what exactly makes people want to find a website builder better that Wix? Here are the three most obvious reasons. For starters, Wix offers you 5(!) plans. Yes, there are five of them. In practice, it means that you need to get ready to take quite some time to decide which plan fits your online project best. For a novice, this is a definite downside. How on Earth, can a non-developer say right away how much storage place (s)he will need for a website to look smart, right? One more funny thing is how Wix manages to misguide its first-time users about the types of subscriptions it offers. The problem starts when you see the line “Site Booster, Form Builder and a free domain are not included in monthly subscriptions”. You understand that there are other subscriptions available, but the official pricing page suggests there is none. To find the information on subscription types, you need to select a plan first. How smart is that? On top of that, Wix requires you to renew the subscription on a regular basis. The subscriptions options are monthly and yearly payments, as well as a 2-year subscription. Sadly, there is no way you can Wix pay once and get it over with. It is a pity to spill the beans but the tech support from Wix leaves a lot to be desired. Let’s put it straight – only if you have the VIP Premium Plan, your question might get answered promptly. As the Web team elegantly puts it, with the VIP plan, “your ticket will be pushed to the front of the line for a quicker response”. No immediate solution to a problem, just a possibility of a quicker response. Honestly speaking, this is not what people expect from the VIP plan, right? In many aspects, it seems that the Wix team decided to compromise the functionality of this website builder for the sake of simplicity. For instance, customizing a website may be time-consuming because Wix does not allow you to fully integrate the third-party applications. In addition, Wix is not the #1 website builder to opt for if you want the SEO-optimized website on an online store. As you understand, the above-mentioned issues with Wix stimulate both novices and web programmers look for a better web builder to make a website in 2018. That is why we are happy to present our list of Wix competitors that are worthy of your attention. 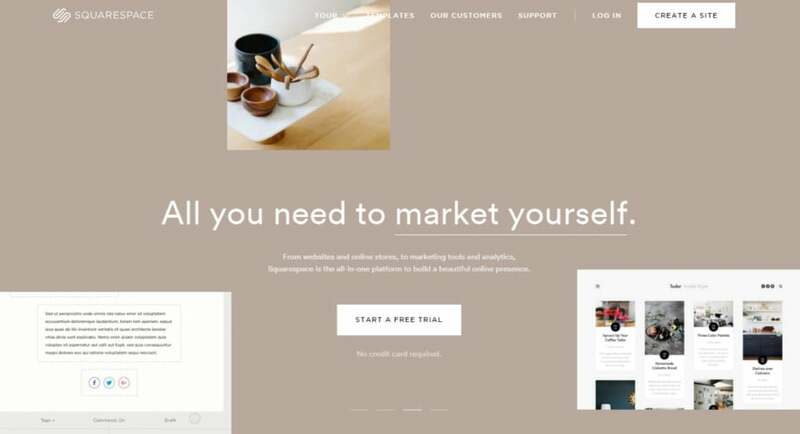 MotoCMS Simple Website Builder stands out among Wix competitors thanks to its collection of pre-populated website builder templates. Firstly, this collection contains more items than any other Wix alternative discussed below. Secondly, MotoCMS offers advanced sorting options to cater to your needs to the fullest. For example, you can choose between 4 types of a template (eStore, responsive Moto3, and HTML templates as well as landing pages) and 60+ market niches. Another great advantage of MotoCMS Website Builder is its top tech support. The tech managers are available 24/7 via a phone call, a live chat, and the help center. On top of that, you will get to enjoy working with the personal assistant for free (!) after you register a 14-day trial. Needless to say, MotoCMS leaves all other Wix competitors in the dust when it comes to helping novices to build their first websites. 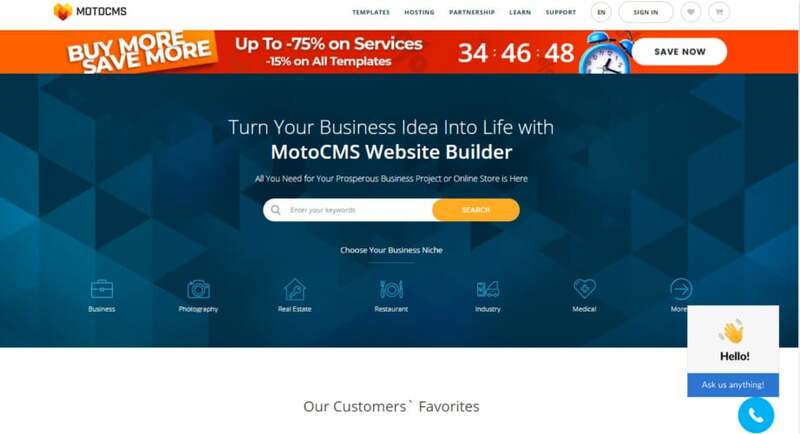 Surprisingly enough, when choosing MotoCMS Website Builder, it is highly probable that you will never learn about the quality of MotoCMS tech support after all. How so? The answer lies in the quality of the admin panel from MotoCMS. As it was created for complete novices, it is self-explanatory and intuitive. Powered by the drag-and-drop functionality and packed with the video tutorials and information buttons, the admin panel is tailored to satisfy the demands of non-programmers to the fullest. It seems that the only downside of MotoCMS Website Builder is its pricing, which may look a bit higher in contrast to other Wix alternatives. However, if to take into account that it is a one-time payment, then the price is more than reasonable. 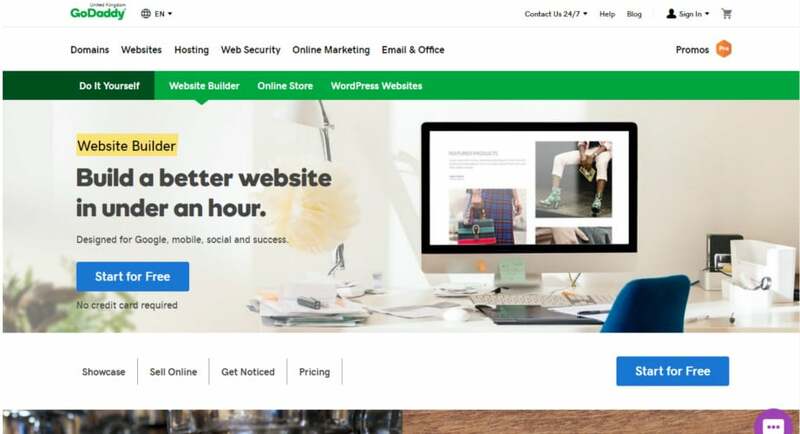 GoDaddy Website Builder is one of the simplest builders you can use to create websites like Wix. But in comparison to Wix, GoDaddy is a bit more expensive. For a personal website, you would pay $5.99/mo, and for an online store – $29.99/mo. What is more, you have to pay for the whole year in advance, which is not that convenient. One more drawback of GoDaddy is that it is limited in terms of the customization. For starters, this website builder does not have the drag-and-drop functionality. As a result, if you are not a web developer, you are stuck with the layout that GoDaddy template already contains. In addition, there are not so many options you can change in the design of a template. These options include colors, fonts, and the overall style. No additional elements or apps can be integrated into the website. On the bright sight, all the website templates that GoDaddy offers are pre-populated. So, you do not have to worry about how to fill your future multi-page website. What also makes GoDaddy a website builder better than Wix is how it deals with the first-comers. The website templates collection from GoDaddy is extensive and contains quite a few niche-specific solutions. However, even this user-friendly website builder has its disadvantages. For example, it is surprising that Weebly still demands 3% transaction fee for an online store (in Starter and Pro plans). Also, the collection of Weebly themes is not properly sorted. For starters, there are only 7 categories of website templates available (i.e. Featured, Online Store, Business, Portfolio, Personal, Event, and Blog). The number of templates to choose from is also not very impressive. For instance, there are only 15 templates for an online store, which does not cover most market niches. Squarespace Website Builder can help you build websites like Wix – quickly and without any coding skills. The Squarespace team makes it very clear with the intensive marketing campaigns, that involve many celebrities. For example, Squarespace YouTube channel contains the video with Jeff Bridges (! ), advertising the website builder. The definite advantage of Squarespace is its collection of templates, that can be sorted according to 15 market niches. In addition, you can pick between such sorting options as Features, Latest, Most Popular. One more positive feature of Squarespace is its straightforward pricing policy. There are only 3 subscriptions plans to choose from, which looks great in comparison to other website builders. Also, unlike GoDaddy and Weebly, Squarespace is rather flexible in terms of payment periods. You can either renew your subscription every month or yearly. On top of that, Squarespace is developer-friendly. Thanks to Git, the version control system created by the Squarespace team, web developers can enjoy the ultimate control over coding. This is especially helpful for small and medium-sized web agencies where several programmers work on one website. With Squarespace, these agencies can optimize their workflow big time. As for disadvantages, Squarespace is often criticized for being less intuitive than other Wix alternatives. The possible explanations for these critical remarks are a bit too big range of customization options and the relatively poor mechanisms for introducing the Squarespace admin panel to newcomers. There are also downsides of Squarespace that are connected with the specifics of the builder itself. For instance, you can not build a menu with more than one sub-navigation. Also, the Squarespace team has not created a Preview Mode for their builder yet. In practice, it means that there is a high chance that your online visitors will experience inconveniences while you are modifying the website. 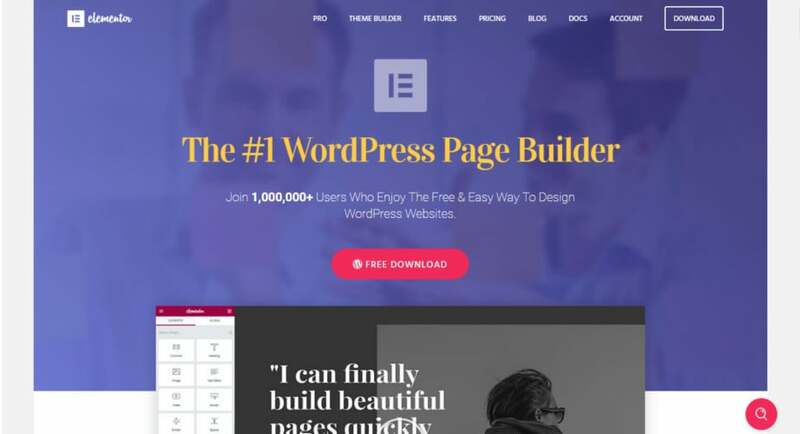 Elementor WordPress Page Builder is a website builder like Wix but it is open-source and much more advanced. Aimed at WordPress websites only, Elementor offers the impressive drag-and-drop functionality. Also, the Elementor team releases new features on the regular basis. With this builder, you know that you stay on top of things in the web world. For instance, now you can not only add website templates to your WordPress project, but also separate content blocks and individual pages. What also makes Elementor a website builder better than Wix is how it deals with the layout. For starters, in Elementor you find 12 (!) layout blocks, each created to make your multi-page website unique and visually attractive with one click. Called sections, these layout blocks can be further customized in terms of width and height. In addition, Elementor is friendly to 3-party web products. You can add these products and perform the advanced styling on them without any extra coding. Elementor is different from other Wix alternatives thanks to the impressive number of its pre-made templates. In fact, there are 300+ ready solutions to cover multiple market niches, which is several times more than Weebly has to offer with its 60+ themes. The only downside of Elementor is its tech support. You can contact the tech team only via ticket-based emails. As there are no direct communication channels like a live chat or a phone, novices and first-time users might experience difficulties when getting started with Elementor. Novi Builder specializes in creating HTML websites only. What makes Novi Builder different from Wix alternatives discussed in this post is its pricing policy. The good news is that to get Novi, you need to choose only between the regular and the unlimited licenses. Also, you pay once. And this fact makes it a website builder better than Wix. The price is more than reasonable with $16 for the regular license and $80 for the unlimited license. For this money, you get access to several web products, i.e. multi-page HTML websites, one page HTML websites, and landing pages. The potential of Novi is truly amazing. Thanks to the three functional modes, i.e. 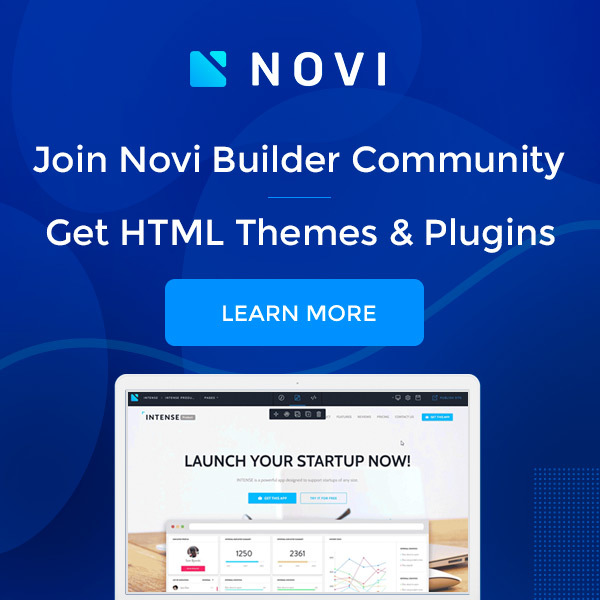 Preview, Edit, and Design, Novi helps you to coordinate the efforts of developers, designers, and a customer. With Novi, you can make any adjustments to HTML and CSS, let alone JS. Novi contains 34 content components, all available for further styling and customization. 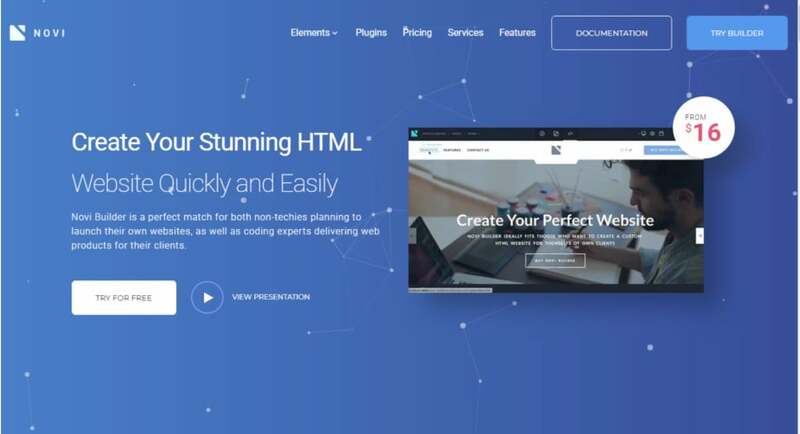 These components, like a radial progress bar, an owl carousel, and testimonials, are aimed at creating websites that look one-of-a-kind and professional. This being said, it looks like Novi requires some web development experience after all. This is why we rate it as the least friendly to non-programmers in comparison to other Wix alternatives discussed in this post. One more issue with Novi is that the tech support it comes with is only short-term, i.e. 6 months. The good news is that you can extend the support up to a year. The bad news is that after a year, you will have to figure out everything on your own. Keep in mind that the Novi tech support does not cover any issues connected with the customization process or problems while installing this builder. 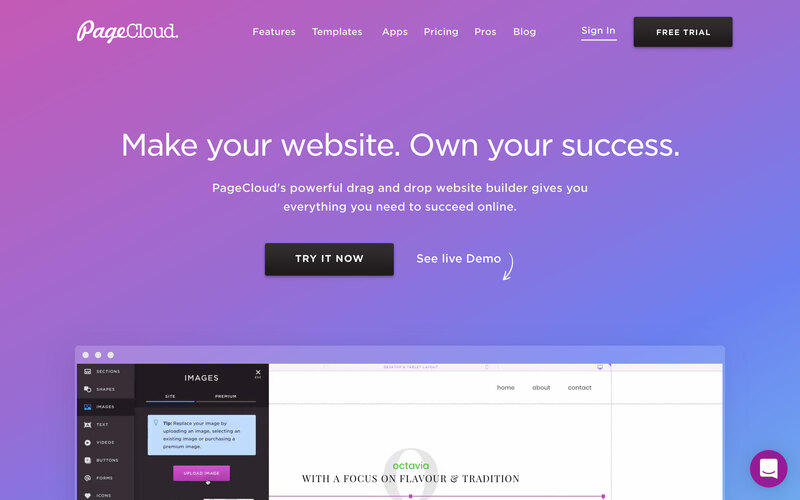 When it comes to the experience you get within the editor, PageCloud is arguably Wix’s closest competitor. Both tools offer what you see is what you get (WYSIWYG) interfaces that let you position your content anywhere on the page. This means that every PageCloud template can be customized in any way. Another one of PageCloud’s key benefits is how fast you can design a high performing custom site. For example, PageCloud allows you to quickly bypass image upload dialogs by dragging in content directly off your desktop and dropping it on your pages. Plus, thanks to PageCloud’s automatic image optimization and unique flat page architecture, every page you create will load in record time. Another cool thing is the dozens of keyboard shortcuts PageCloud has to offer that makes you feel like you’re using one of your favorite desktop apps. 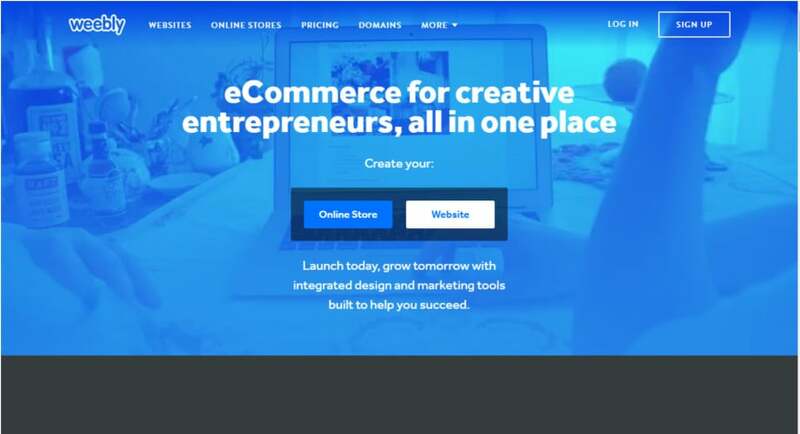 Already Picked a Website Builder Better than Wix? As you can see from the table below, every website builder better than Wix is unique in its own way. MotoCMS is the #1 choice for complete novices thanks to its rich niche-specific collection of templates and the unbeatable tech support. GoDaddy is the least expensive website builder on the list. However, it lacks the drag-and-drop functionality. The Weebly builder is user-friendly and fun to deal with but the assortment of its templates is confusingly limited. Squarespace designs are elegant and allow the intensive customization. Elementor attracts attention as it is initially free. Novi seems to be really handy for creating websites for beginner web designers and small web agencies. All in all, the web market is full of website builders. Regardless of how much you know about the web development or the web design, you will be able to find the website builder better than Wix, no doubts. So, have a look at the table above again, make the right choice, and create online projects with ease!